We’ve come to believe that the course work is really about seeking the peace within the chaos – the Truth within the triggers. Life is not about NOT being triggered. Life is about bringing understanding and AWARENESS to our triggers and moments when our emotions come up. We see, a lot of people we know who make the mistake of shooting for a “recovery bypass” – where they try to deny their humanness, they try to deny their emotions, they try to put their negativity and triggers in a box and then pretend they don’t exist. And then – over time – they stack up – and BOOM – we have a breakdown, an emotional explosion or other expression. Having these moments doesn’t mean something is wrong with us. It means we are human. Here at The Stages, we advocate full acceptance and expression of our human nature. This lets us be fully alive. From there, we also believe in tapping into the higher awareness that is our child within, that is the observer of the human mind and emotions from our childhood. We are part child within, part intuitive voice. To deny either is to deny who we are. We can’t just sit around and justify our negativity as “being adult.” And we also can’t not express ourselves because we are “child within.” We need both. We are both. This is the beautiful balance that we get to walk as the child within having an adult experience. We have found that when we let ourself express, when we allow our child within to be who we are – without any judgment – amazing things happen. And once we fully express ourself – without judgment – we do our best to bring our awareness, our child withins perspective into the moment. Our aim is to have our child awareness be there as we are being triggered, so that we catch ourself faster from crashing into dissociation. We must allow ourselves to express ourselves; we must allow ourselves to be FULLY child within and FULLY adult. How can we allow ourself to be both child within and adult? 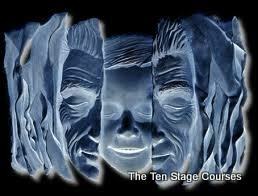 The Stages advocate full acceptance and expression of our human nature. Labels: BOOM – nice Stager is GONE and triggered Stager shows up.